Little House Home Arts: What Would Jane Do? A few nights ago, as I crawled into bed I reached for a small book I received for Christmas entitled, What Would Jane Do?. 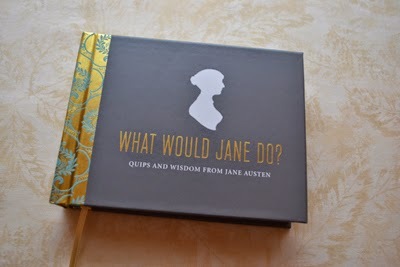 It is a book of quotes from Jane Austen's best known books. She is one of my favorite authors. Like many of her readers, I have fallen in love with Mr. Darcy! I had gone to bed early, exhausted from a day that was too short. I was grumpy and knew that it was best to retire early. I had just had an argument with my husband about world affairs and so looking at my book just before falling asleep, I pondered more than read, What Would Jane Do? It was clear, I thought that Jane (McMillen) should have married the fictional character Mr. Darcy instead of her husband, but then my mind wandered to thoughts of what I would do if I was in charge of the world. My thoughts weren't unlike Doctor Zuess's thoughts in his book, If I Ran the Zoo. I was again annoyed with being a mere mortal and I wished at that moment to have great powers to alter what is happening in the world. I laughed as I thought of Jane Austen's words coming out of the mouth of her character, Catherine DeBourgh when she snidely remarked to Lizzie's mother, "You have a very small garden, Madame!" My world is indeed very small and no matter the world's problems, I can't even seem to fix my own! It didn't take but a few minutes for me to be in a deep dream state, and I dreamt that I appliqued pieces of fabric over the countries that are literally torn apart with war, torture and unrest and made it beautiful again! 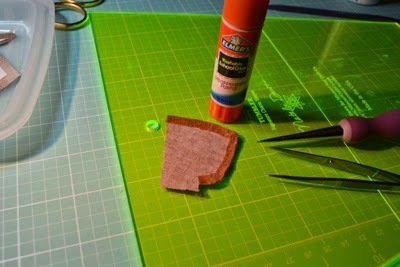 I used the new-to-me "freezer paper technique" to get great detail of the Mid-Eastern countries' borders and simply glued the edges of fabric under using an Elmer's Disappearing Purple School Glue Stick and appliqued them back in place with perfect precision! It was a big contribution to world peace and I was deeply satisfied! I am sure that this solution came to my brain, as I am in the middle of making a wall hanging for a friend of mine and I am using a new technique I learned on-line from Teresa Rawson's fabrictherapy.blogspot.com. She has marvelous tutorials on applique and it was only that afternoon I had learned that, even I can applique with precision using her method. My friend who wanted a quilted wall hanging, is an old high school acquaintance from a half a century ago now. We became reacquainted over the internet, exchanging superficial greetings through a mutual friend of ours, and found that we both had "health issues" in common. His wife was sick with Chronic Fatigue/ Fibromyalgia and I had similar symptoms with Chronic Lyme Disease. We compared notes and offered each other sympathy. Soon after that, his wife developed Stage Four Lung Cancer and died less than a year later. I supported my friend as best as I could through emails during his tragic loss. He asked that I make him a wall hanging and found a picture in one of my Japanese quilt books when he and his friend were visiting me this summer. It was a picture of a quilted border of a Japanese quilt, and was anything but inspiring to me until I noted that it appeared to be a mountain with a sun, albeit turned sideways and so dark and dreary that it was anything but recognizable. My friend is more complex than me and appreciated the abstract, whereas I am more concrete and simple. His world is full of sadness and loss, where I seem to live in an unreal Pollyanna world where my delusions seem to keep me falsely and nauseatingly too optimistic! My Japanese Daiwabo taupe materials aren't bright and cheery but are very rich and appealing, and it was from this stash that my friend picked out some fat quarters to make his wall hanging. He chose a dull yellow-gold/orange-ish colored print, a deep burgundy print and a dull green-brown nubby material along with a similar dark brown nubby fabric. His choices were too dark for me and it took me quite a while to warm up to this project. Fortunately he was in no hurry. I had warned him that I had to finish my year of craft sales and that I would likely start it in January. What would Jane do with the pattern and material that my friend had chosen, I ask? She would embrace the task at hand and do the best she could, I resoundly answered.... And that is what I am in the process of doing. True to my Pollyanna self, however, I needed to brighten the mountain and add the sun's reflection on it, just as I wanted to brighten my friend's life. Suffering from the loss of his wife who was truly the sunshine of his life, I added, with his permission, a variety of other taupe fabrics in hopes of adding more color, texture and interest to this work. As I did, I reflected how I had wanted to encourage him to open himself up to new people and life following his wife's death. As my friend placed a serious confidence in me when I was supporting him, I felt it now my turn to stitch this piece for him with equal seriousness. It was with my delusional Pollyanna-Jane thoughts that I am stitching his own personal mountain (though it looks more like a house), and adding sunshine. That is after all "what (Pollyanna) Jane would do" to brighten his life? It is a good thing my other projects are less serious, or are they? 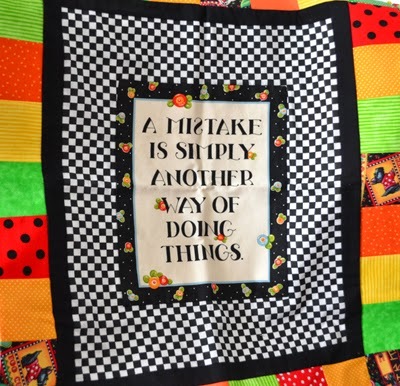 I am stitching whimsical patchwork duvet covers for my girls, reminding them to stay young at heart and take life a little less seriously, and making covers instead of comforters, so as to make it easier for them to keep them clean and washed? I remain their mother, after all! 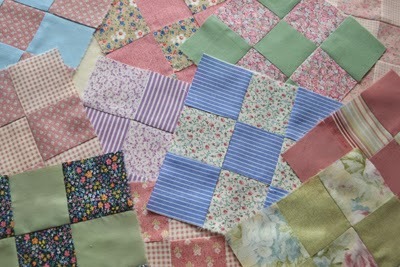 And the Nine Patch blocks I am piecing for my friend are made from fabrics that she sent to me after her mother had passed away. I had instantly seen them as a quilt to wrap about and comfort my friend, who is now having to bravely carry on as the sole survivor of her family. 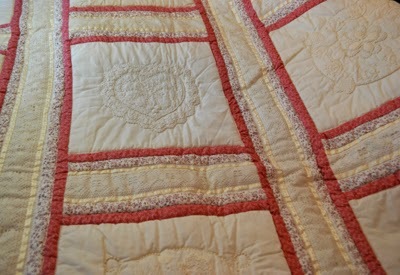 And my other quilted works? Are they an extension of this noble, Pollyanna-Jane thinking as well? Making a crazy quilt to preserve the beautiful clothes that my mother had so wonderfully made or purchased for me? 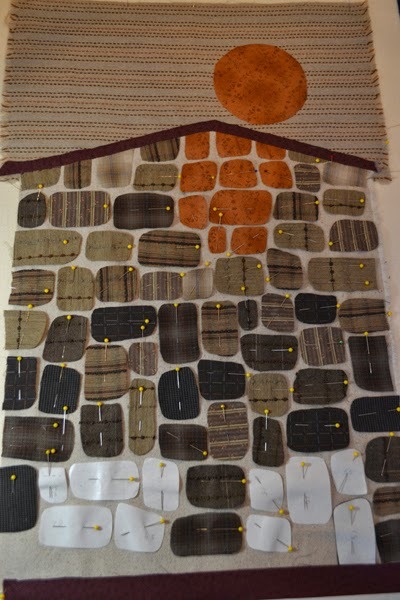 And my wool penny rug sampler quilt that had seemed to create itself? 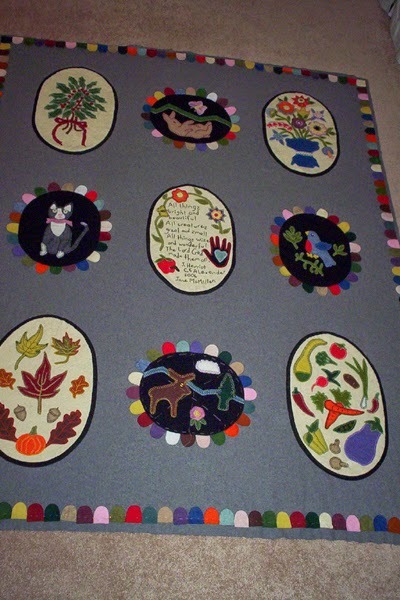 Bright flowers, and animals all appliqued on my penny rugs, using the very patterns my mother had used in many of her quilts, and adding animals much like she had grown up with on or near the farm in Nebraska where she was raised? 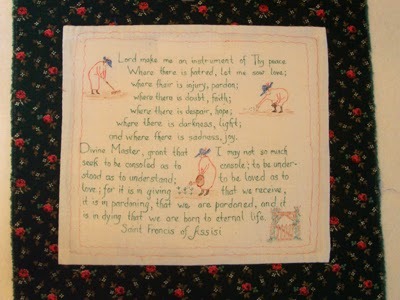 Stitched by hand, as I sat with my mother in her final days, I then embroidered a dedication block on the back of it to her. Wasn't it all done so that Pollyanna Jane could recreate a symbol of my mother who would remain with me forever? 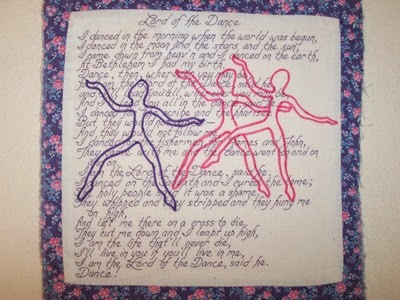 And what about My Comfort Her, a quilt with all my favorite songs, hymns, quotes and scripture verses, using pen, ink and caligraphy; my humor and values illustrated with pictures sketched from my favorite children's books in what I hope is truly permanent quilter's ink? Isn't it another sample of "what Jane would do and be" and will God-willing, finish! I may live in my own delusional world but it comes out in my work, and little did I know then that it all is in answer to the question of "what would Jane do". 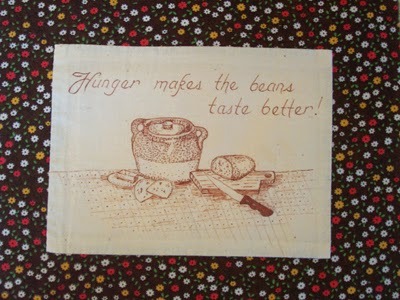 But isn't this the life of every quilter, taking the scraps of her life and creating her own beautiful world with them?